Aruba may not be a tropical paradise (in fact, it has an arid desert-like landscape), but its mix of the predictable year-round weather outside the hurricane zone, friendly people, and ample resorts and attractions have made this Dutch-flavored island one of the most popular destinations in the Caribbean. Aruba has some interesting natural wonders, including caves, rugged seashores, and sunken reefs; horseback riding, desert ATV tours, and scuba and snorkeling are popular diversions. But many of its best attractions are of the manmade variety, including the charms of the capital city of Oranjestad and Fort Zoutman, the island's great assortment of restaurants, and of course the many nightlife options, from casinos to hip nightclubs, even a glow-in-the-dark bowling alley and arcade at the Palm Beach Plaza Mall. Aruba is famed for its flat, white-sand beaches. The wind-bent divi-divi tree is the most recognizable national symbol of Aruba, so it's no surprise that the beaches tend to be quite breezy, a boon for windsurfers. Eagle Beach and Palm Beach, home to many of the island's big resorts, are among the most popular. You'll find more privacy at Rodger's Beach in San Nicholas or Andicuri Beach near the former Natural Bridge on the island's rugged northeast side. 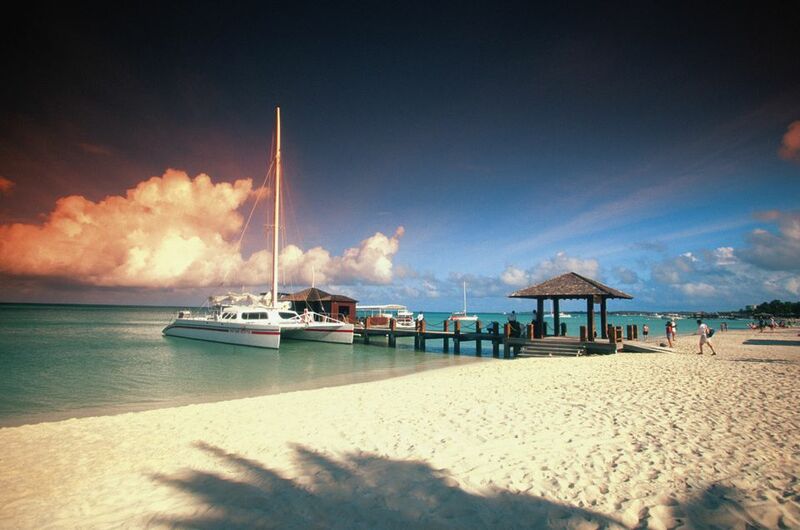 Aruba is primarily known for its big resorts, notably the high-rise hotels along Palm Beach. Here you'll find familiar brands like Marriott and Hyatt, plus three all-inclusive Divi resorts that boast brand new spas, 60 new rooms, and the new PureBeach restaurant. Other options include private villas and homes and -- for the budget-minded -- apartment rentals. Aruba has the widest variety of dining options in the Caribbean outside of Puerto Rico, from familiar fast-food outlets (McDonald's, KFC, Wendy's, and Sbarro, to name a few) to fine restaurants serving traditional Aruban dishes like shrimp en cacao in historic country homes. Proximity to Argentina also means an abundance of steakhouses, many serving wood-grilled churrasco-style dishes. Overall, Aruba has as fine a selection of restaurants as you'll find in many U.S. cities. First inhabited by the Arawak Indians and colonized by the Dutch, Aruba has enjoyed three major economic boons during its history: gold, oil, and tourism. This prosperity, along with the fact that a plantation economy never emerged, may help explain the genial nature of island residents. Aruba declared its independence from the Netherlands Antilles in 1986, and while the Dutch influence remains, Aruba is really a cultural melting pot, as evidenced by its mixed native language, Papiamento. Aruba's annual Carnival is the highlight of the social season, running from late January to early February. Islanders' love of the sea is reflected in the annual Hi-Winds windsurfing competition in mid-summer and the Aruba Heineken Catamaran Regatta in November. The Tierra del Sol resort holds an annual Pro-Am golf tournament, and audiophiles flock to the Soul Beach Music Festival and the Aruba Music Festival. Aruba after dark features a little bit of everything, from partying at the Sky Lounge to taking a ride on the Kukoo Kunuku, the wildest and crazy bus there ever was. Aruba has party boats and party buses, but also more sedate Vegas-style shows, salsa dancing, and casino gambling. Hotels have beach barbecues and cocktail hours. Or just grab a tropical drink and stroll along the beach or enjoy shopping at night.